Twin stick shooters have seen a bit of a revival in the past few years, a trend no doubt started by Geometry Wars on Xbox Live Arcade in 2005. Since then we've seen everything from clones to new takes on the genre, as well as everything in between. 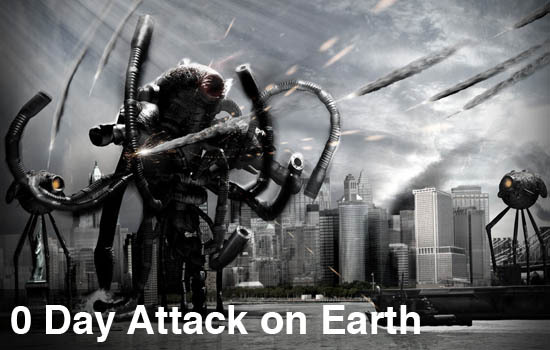 The latest game in this group is called 0 Day Attack on Earth from developer GULTI and published by Square-Enix. 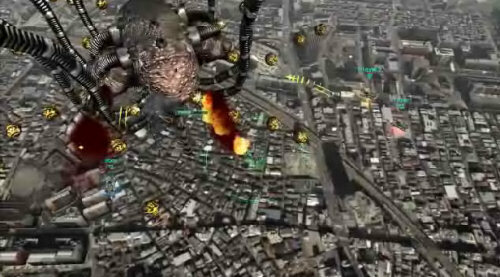 The concept of the game is simple: stop aliens from attacking New York, Paris, and Tokyo, which are all modeled from Google-like satellite imagery. Sadly I don't even think Google can save this game... or this planet. In typical twin stick shooter fashion you kill enemies which drop energy orbs that increase the attack power of your ship. You have a choice amongst a few ships to start, with more unlocked, and each one has various speeds, abilities and upgrades. I generally stuck with a ship that fired missiles when upgraded along with a machine gun as the primary weapon - but most players online seemed to like a helicopter that was able to shoot forwards and backwards at the same time. Left bumper will give you a burst of speed, and the right one will give you a bomb attack obliterating enemies in a radius around you. To complete a level you need to clear out the "bosses" marked in orange on your radar. These are the only creatures you need to kill to complete the level, though other various mini-bosses and smaller aliens litter the level. There's a time limit at play as well, and if you don't clear the bosses, it's game over. All the creatures in the game, bosses included, have predictable attack patterns which are easily learned, but not easily avoided. Each city as their own unique set of creatures, as well as a final boss battle to further enrage you. There's some pretty big annoyances too, mostly cheap deaths from the bosses after only 2 hits. Another is the giant purple electrical clouds that kill you when you touch them, an add an artificial barrier to the otherwise free world. The screen gets crowded pretty fast, and soon it becomes difficult to determine not only where you are, but what you are shooting at. You'll come to despise those stupid tentacles on these guys. There's always four ships on the screen assisting in the battle, whether those are manned by humans or AI is up to you. If the world was under attack by gigantic alien creatures, the last people I'd want protecting me are the AI players in this game. I'm pretty sure the script for AI is completely random or written by slamming a keyboard. At times, your partners basically shoot at nothing. There will be one giant enemy left that you are shooting at, and the AI is dancing around, crashing into clouds, and shooting at the air. Thankfully the co-op comes to the rescue. You can play through the entire game online (sorry, no local), with breaks in between days to drop in or out players. With the stupid AI gone, the difficulty of the game becomes much more manageable. If you do happen to run through your shared pool of lives, the game puts you in a crystal somewhere randomly on the map, and an friend can come break it and save you. Alternatively there's a countdown timer that will respawn you if no one has saved you in time. If all players are trapped in the crystal, it's game over. Some enemies can grasp you, and your teammates need to shoot them off of you. These few things make the co-op mode somewhat more interesting. The biggest gripe I have with the 0 Day Attack on Earth is it just feels so uninspired. Controls at times feel clunky, the graphics are average at best and there's very little depth past the first day of any city. It's just rinse and repeat. Playing by yourself is unrewarding, and finding someone to play with in the online ghost town for the game is a lesson in patience. There's just no way I can recommend playing this game at it's current $15 price tag. The Co-Op Experience: Team up with friends to stop the impending alien invasion.